Home Giveaway What’s your desk type? So over the last couple of months, there’s been some serious home interiors content creeping on the site as I fall in love with decorating, styling and creating an even ‘holier’ home – is that possible? Now, first of all, I often neglect thinking about the one place I spend the majority of my time. The Office. Probably because it’s more functional than pretty? According to Fellowes though, they’ve unveiled the seven types of desks that the most highly efficient and effective people have. Which seems like they say a lot about their owner. Which archetype are you? Let me know in the comments below! Now you know yours, let’s find out about the other archetypes. A place for everything and everything in its place, OCD is A-OK! 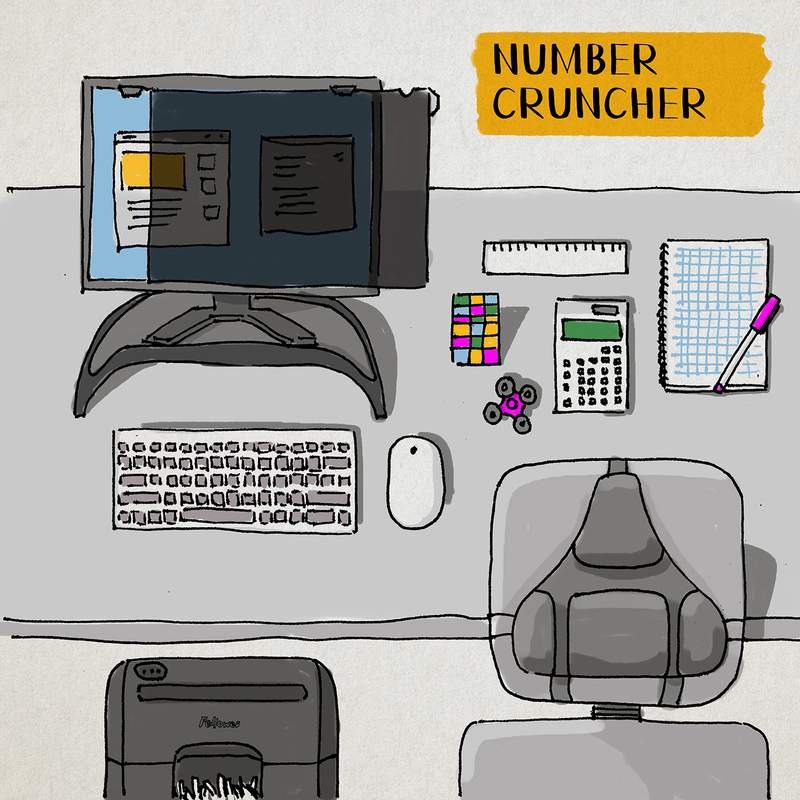 With a perfectly clean and tidy desk, you need to have all your equipment exactly where it should be. As a result, neat and precise and creatively organised. If it’s not a right angle, it’s a wrong angle! Therefore a perfect work set up with your monitor riser at just the right height and everything within reach, there is nothing you can’t achieve. Your file organisers brimming with immaculate documents in alphabetical order to ensure you know where everything is and to optimise productivity. With your sleek laminator all set to laminate a document at a moment’s notice you know that organisation is most noteworthy to creativity and getting the job done. While you’re finding inspiration in everything around you, you are always on the lookout for the next great idea. 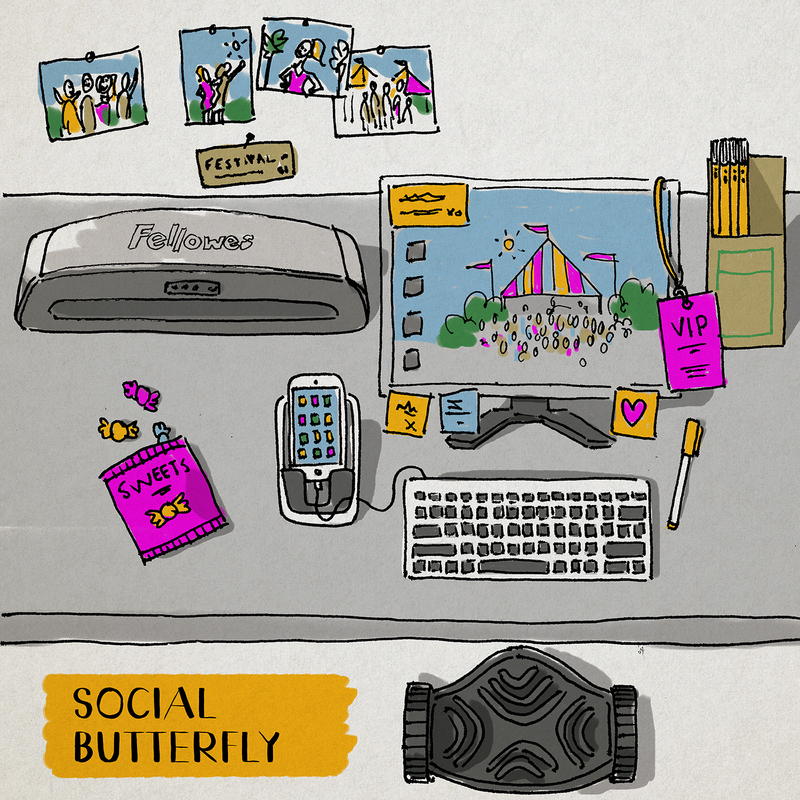 Stimulated by pretty much whatever you lay your eyes on, consequently, your workstation has to be a creative hotspot. With your desk surrounded by images, magazines and photography. An inspirational quote on your screen, a bound book of the latest magazine clippings and a mood board of laminated images and you are ready to go. Having the freedom to explore everything that’s out there and bring it back to inspire your work allows you to do the best job possible. Most of all, who says you can’t reinvent the wheel? Just give you a couple of hours and we’ll be ready to hit the road. You are a people-person through and through. You thrive by having your colleagues around you all day long. Your workstation is surrounded with pictures of you and your friends out and about having fun. People keep you going and inspire you to do an amazing job. Your desk is set up for connections and communications, with your phone exactly where you need it for the all-important creative conference call. An array of colourful post-it notes are littered around your screen (to remind you who you must speak to or tweet this week). Most importantly, however, is the calendar on the wall and the accompanying prized marker pen for keeping on top of your social engagements – all colour-coded and rather creative! Numbers never lie and they always make sense. The bottom line is the only line that counts and you know there is nowhere better to hang out than in column A of an Excel spreadsheet. Especially relevant is a Rubik’s cube and lone fidget spinner which sit on piles of squared paper next to your keyboard. A calculator and ruler are always so handy. Your screen is fitted with a blackout privacy filter to avoid prying eyes, and the shredder is always powered up to keep sensitive information getting into the wrong hands. The workstation is set up for keeping you in the zone, counting numbers and making money. People who say there is nothing creative about algebra just aren’t doing it right! 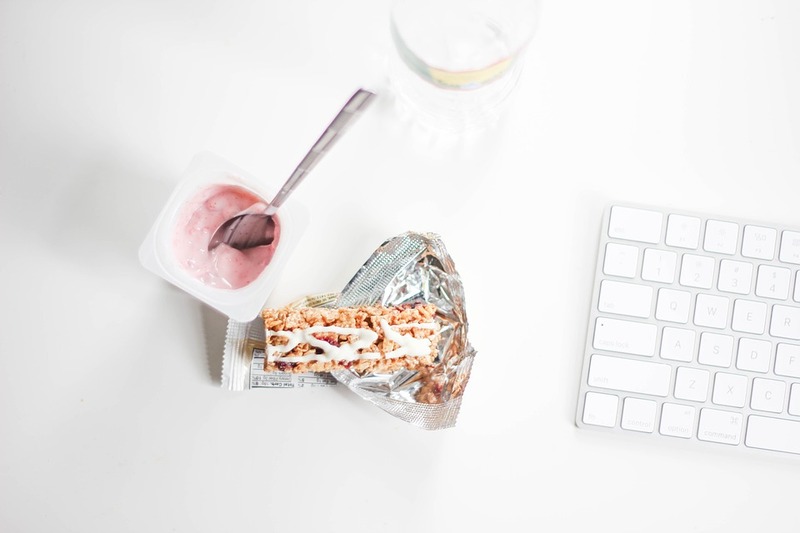 Because your desk is your home away from home. To do an amazing job you simply have to be surrounded by a creative display of photos of your favourite times with family notes from friends, postcards and invitations stacked high alongside your laptop. Consequently, a family photo, your children’s drawings and school timetables are tacked to your corkboard planner. These are the things that keep you inspired to do the very best job you can! While you have your laminated photos and school reports you have your desk set up to remind you why you do what you do and keep the rest of the workplace up to date with what’s going on! ‘How’s your daughter doing’ your colleague says? Pass me that photo album and I’ll probably tell you everything! 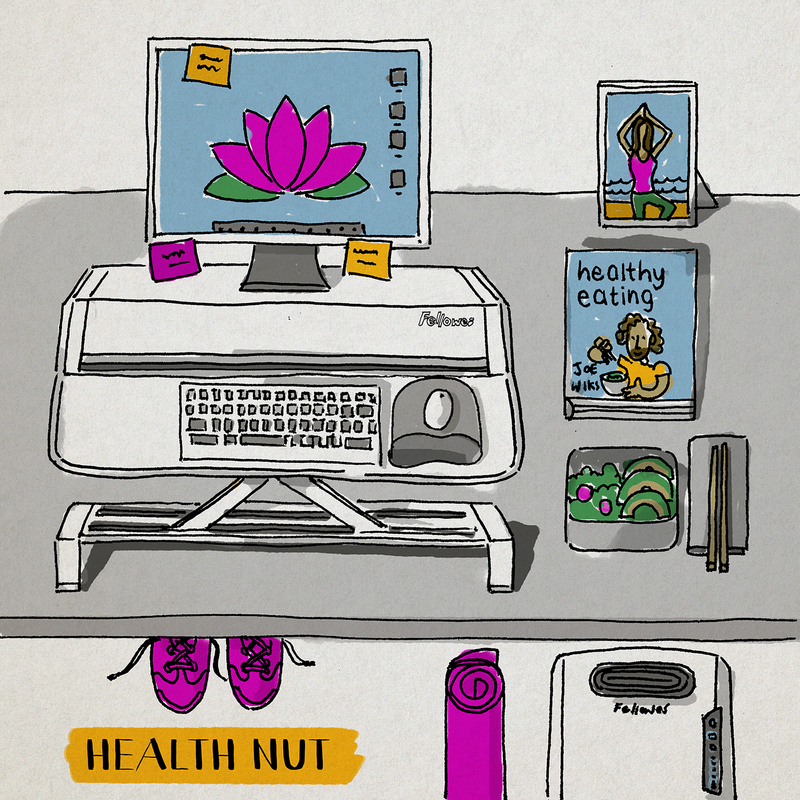 With your Body Coach cookbook rather proudly standing on your desk and next to your healthy lunch to feast on after a spot of yoga. It seems like you know there is nothing better you can do for your career than look after number one. When you feel good, you are truly at your most creative and can do anything in the workplace! Everything around you is set to keep you as healthy as possible, from your sit-stand workstation and ergonomics workspace accessories to your air purifier to keep any nasties out of the air you breathe. You want everyone else to feel as good as you do and will always be the one bringing the kale and carrot smoothies into the team meeting. You are a creative clean machine and most of all, ready to get the job done! 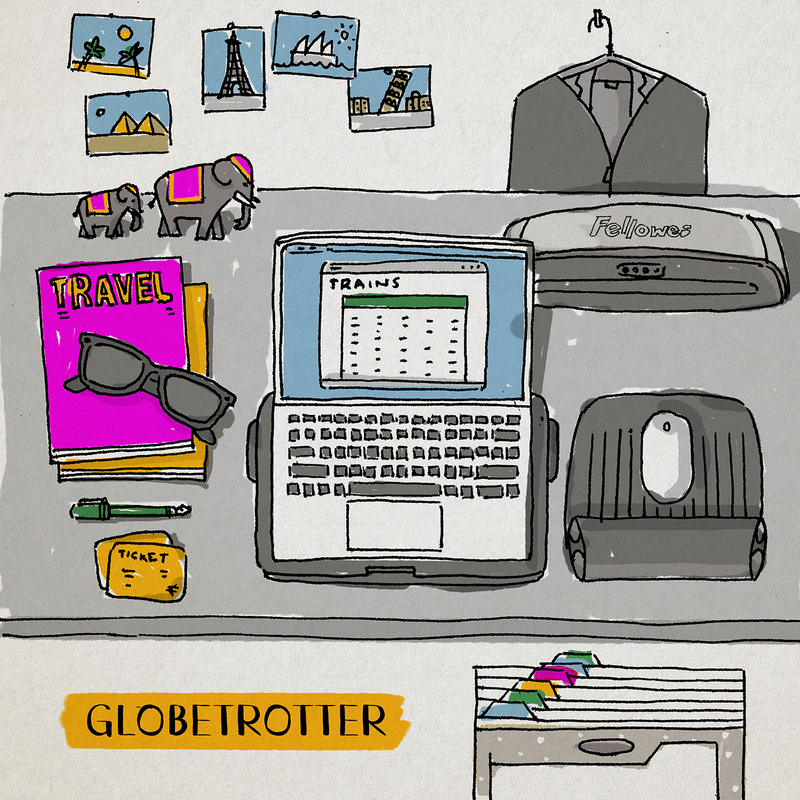 Your workspace is full of postcards and souvenirs from your trips for business and pleasure around the globe. While you’re ready to go at a moment’s notice you are not constrained by your desk. The world is your office and as a result, you are ever ready to go out there and make it happen. A map of the world mouse mat is home to your ergonomic mouse and with your sunglasses ready for action, you’re set for the next adventure with your Laptop Go Riser and mobile organiser file. You only need two minutes’ notice and you’ll be on that plane! 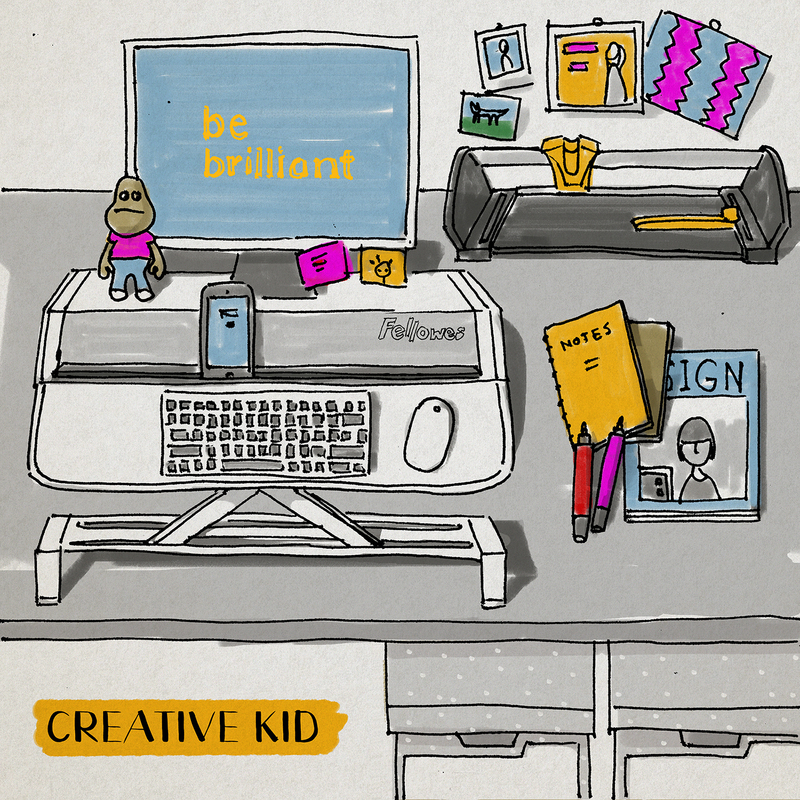 You know what you need to get the job done – and the tools to do it creatively. Now, where are we off to next? 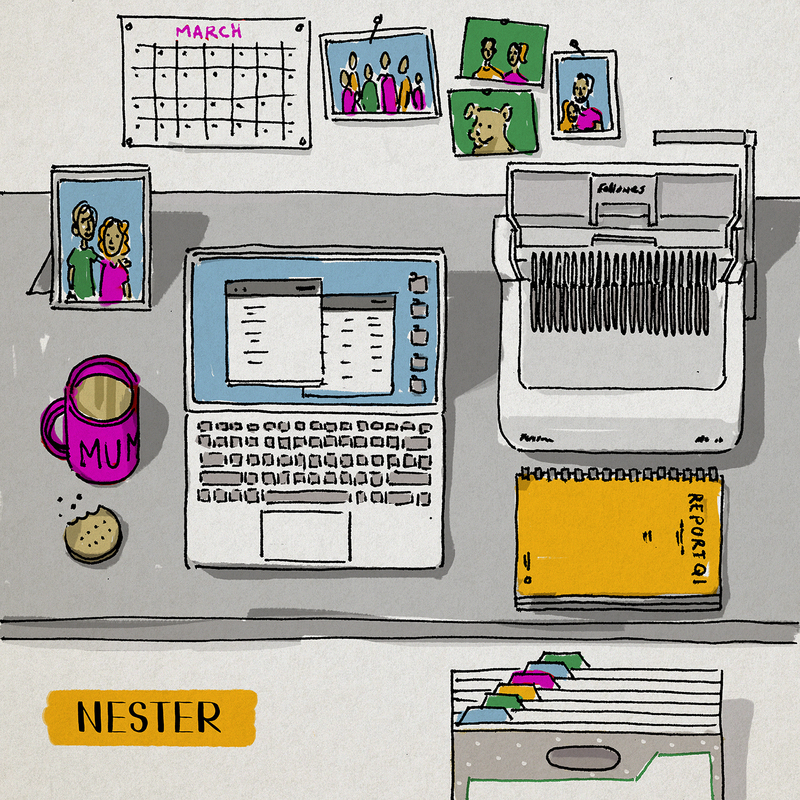 So you want to WIN a Fellowes Binder or Laminator? Entering is simple! 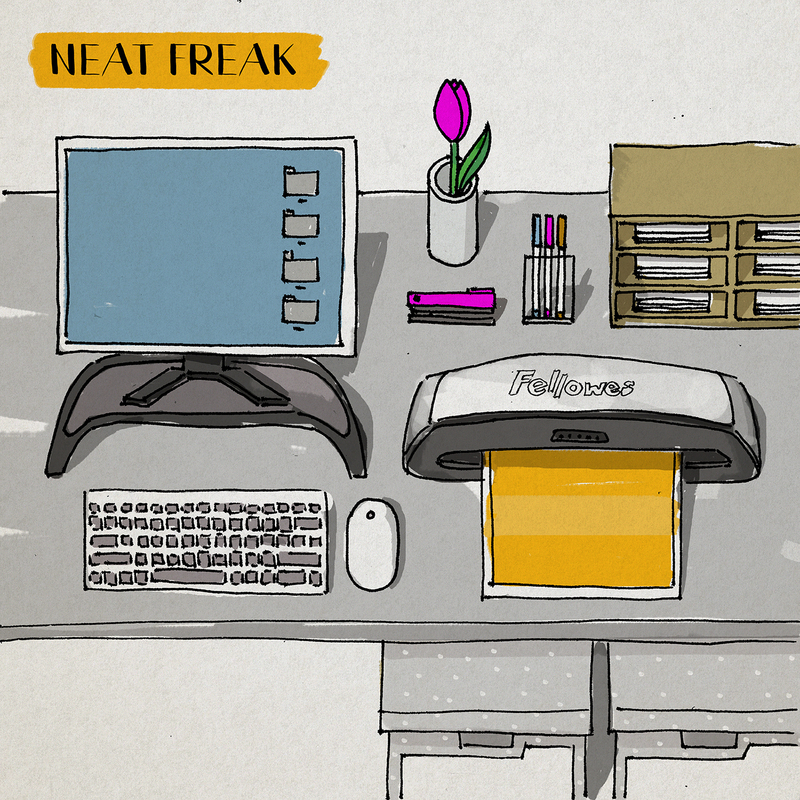 Sharing photos of your desk and identify which desk type relates to you best. Make sure you tag @FellowesUK on Twitter or Instagram in your post and include the hashtags #inspiringcreativity and #Fellowes. Tag @laurajdawson26 too so I can check them out too! Competition t&cs; first of all, it is only available to residents in the UK and the competition closes 14th September 2017. Good Luck!